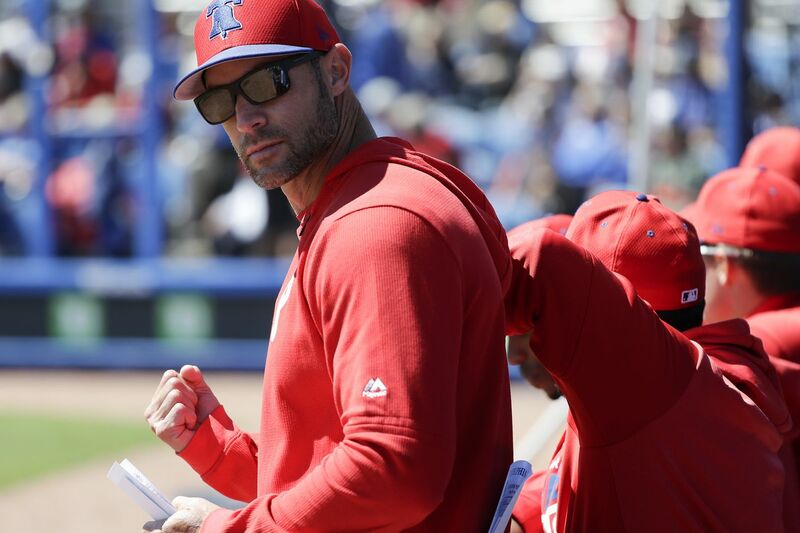 Nagging injuries in spring training could leave Phillies manager Gabe Kapler with a few challenging roster decisions. Bryce Harper agreed to terms on his record-setting contract 11 days ago. He held his introductory news conference atop the Spectrum Field dugout nine days ago. He got his first at-bats in a simulated game five days ago. Yet somehow Harper played in a spring-training game before Odubel Herrera and David Robertson, both of whom were present from the first day the Phillies opened their camp last month. Herrera strained his left hamstring during a baserunning drill in one of the Phillies’ first workouts, then came down with the flu last week, hardly the start that he hoped for as he competes to retain the center-field job. Robertson, meanwhile, is building arm strength gradually, an approach he has taken in recent years. The veteran reliever made only five spring-training appearances in each of the past two seasons and appears to be on a similar track this year with opening day set for March 28. Will center fielder Odubel Herrera be ready for the Phillies' season-opener? Opening day is 17 days away. Does Gabe Kapler know who his center fielder is? How’s that for a hedge? Injuries have left the Phillies with questions at multiple spots. It isn’t only Herrera, who is at least five days from making his Grapefruit League debut. Second baseman Cesar Hernandez (strained right hip flexor) hasn’t played since Feb. 25, while outfielder Roman Quinn (strained right oblique) has been sidelined since Feb. 24. Reliever Tommy Hunter (strained right flexor tendon) hasn’t pitched in a game yet. At this point, it seems likelier that Herrera and Hernandez will be ready for opening day than Quinn and Hunter. Also, while the Phillies keep monitoring the free-agent market, they aren’t planning to sign lefty Dallas Keuchel or closer Craig Kimbrel unless either pitcher falls into their lap on a one-year contract. Dylan Cozens is giving the Phillies something to think about, especially with Herrera and Quinn banged up. The 25-year-old outfielder went deep again Saturday and has three homers in 25 spring-training at-bats. But Altherr can’t be sent to the minors without being exposed to waivers. By keeping Altherr over Cozens, the Phillies could maintain outfield depth, at least until Quinn returns. If Hernandez isn’t ready for the opener, it could present an opportunity for utilitymen Sean Rodriguez, Austin Romine or Trevor Plouffe. None is on the 40-man roster, but all have big-league experience and enough versatility to back up Kingery at second base and play other positions on the infield. Missed Harper’s first spring-training game? Here’s everything you need to know about how it went. He’s scheduled to play right field today against the Rays at Spectrum Field. Forty years ago, Pete Rose was Bryce Harper, a superstar free agent who signed a huge contract with the Phillies. Last week, I spoke with “Charlie Hustle," who had advice for Bryce about thriving amid impossibly high expectations in Philadelphia. David Murphy spent a few days in Phillies camp, and as usual, The Cheese came away with a few opinions, including an interesting thought on Mike Trout. Today: With Harper in right field, Phillies vs. Rays in Clearwater, 1:05 p.m.
Wednesday: Phillies vs. Yankees under the lights in Tampa, 6:35 p.m.
March 25: Spring-training finale vs. Rays in Clearwater, 1:05 p.m.
April 1: Harper returns to Washington to face his former team, 7:05 p.m.
Bryce Harper salutes Rhys Hoskins after the latter homered against the Blue Jays in a spring-training game Saturday. Harper drew two walks Saturday in his first two spring-training plate appearances for the Phillies. But that should come as no surprise. He ranked second in the majors last season with an 18.7 percent walk rate. The only player who walked more often than Harper: Trout (20.1 percent). And so, when Rhys Hoskins followed the first walk by crushing a home run over the roof of the tiki bar in left field, Harper saluted him at home plate. Indeed, the best way for the Phillies to force opponents to pitch to Harper is for the batters behind him, particularly Hoskins, to drive him home. With the Nationals last season, Harper led the National League in walks (130), had the league’s sixth-highest on-base percentage (.393), and scored the sixth-most runs (103). Question: I’m confused. For two springs, [Scott] Kingery showed he’s more than adequate playing second base. We now have Cesar [Hernandez] injured and Kingery has yet to see any time at second. Is he destined to be a utility player? Answer: Good question, Dennis, and thanks for reading. My sense is the Phillies still view Kingery as their future second baseman, probably as soon as next season after Hernandez leaves as a free agent. For now, though, they believe his versatility makes him a valuable asset. If everyone’s healthy, and the Phillies think Hernandez will be ready for opening day, you’ll see Kingery bounce from second base to third. I think he will even play some center field. But if Hernandez progresses more slowly than expected, Kingery almost certainly will begin the season at second base.